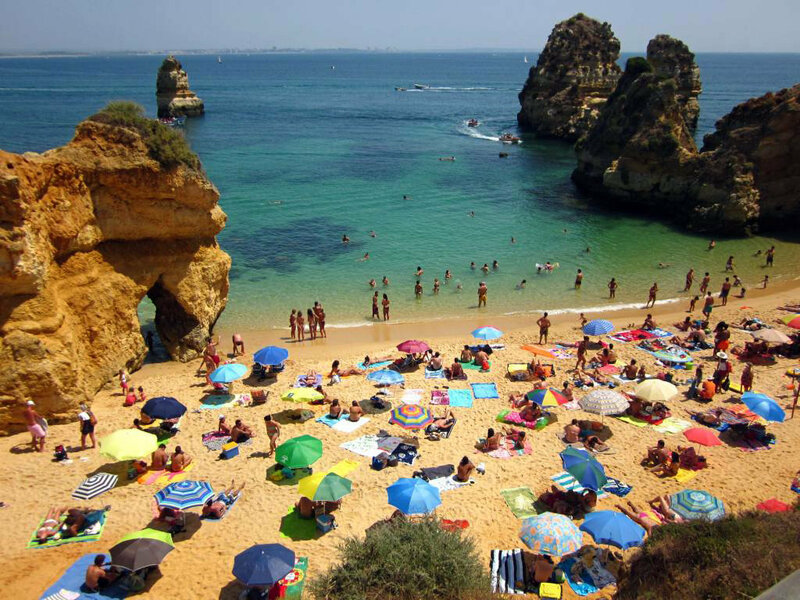 Praia do Camilo is a picture perfect beach near Lagos. This secluded and characteristic beach is highly esteemed in the world among locals, tourists, experts and popular websites such as TripAdvisor. 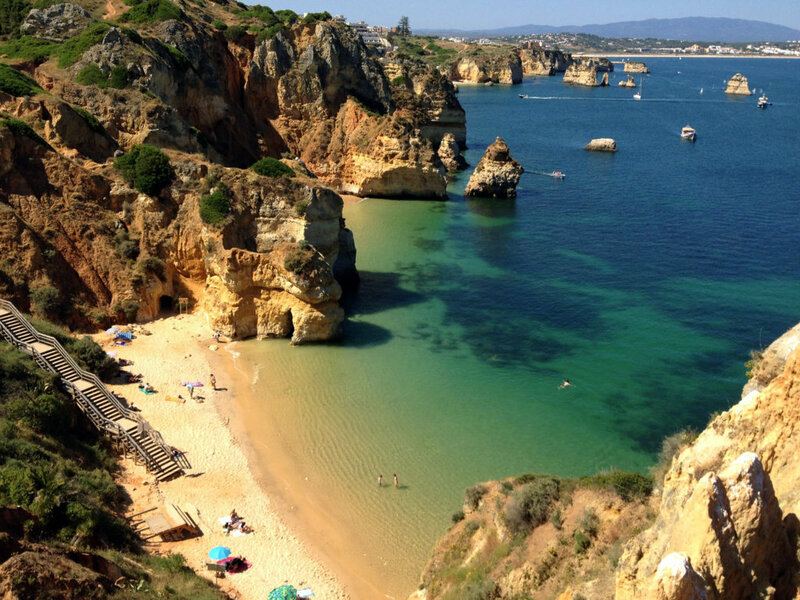 Praia do Camilo is located between the other wonders the region has to offer: Praia da Dona Ana and Ponte da Piedade. The TripAdvisor community named this beach the #3 thing to do in Lagos. In this article we will tell you why. See for yourself how beautiful this precious beach is in this short video. Don’t you just love the sound of the ocean? To get to Praia do Camilo, you have to descend a long wooden stairs of about 200 steps that makes for an incredible picture. The stairs allow you to access the beach more safely, but it does require a bit of an effort. Once you arrive downstairs, you will find that the effort has been worthwhile. Praia do Camilo consists of two small beaches that are connected through a cave hole tunnel. The tunnel can be found on the left part of the beach. Watch what it is like to walk through the tunnel in the short video below. From the top of the cliffs, you have an amazing view over the beach and the bay of Lagos. Notice that some of the rocks have peculiar shapes. The rock formation protects the beach from the wind of the azure blue ocean, allowing a calm and safe environment for sunbathing and swimming. Make sure to check out Ponte da Piedade as well. From Praia do Camilo, it is only a short walk to there. Since the beach is protected by rock formations, there is not a lot of wind. The rock formations of Ponte da Piedade protect Camilo beach against waves from the southwest. This is why the sea here is very calm. In addition, the sea is quite shallow and the water is not too cold. This makes Praia do Camilo a great beach for snorkeling. The sea here is exceptionally clean. The water has a superb green colour and is almost transparent. You will be able to see several fishes when snorkeling. There is a whole world underwater that you can explore for yourself at Praia do Camilo. Praia do Camilo can be visited all year round and is a real paradise in winter. During summer it is a very popular beach and due to its relatively small size, it can get completely packed. You will not have a lot of space on this beach in the summer. Whenever you go, make sure either arrive very early (to avoid the crowds) or to watch the sunset from the cliffs up above, which is absolutely stunning. Praia do Camilo is a pretty small beach. Especially during high tide the beach loses half of its size. It is recommended to visit this beach during low tide, otherwise there might be a lack of space. Beware that the tide can turn quite quickly (in a couple of hours). On top of the cliffs there is the restaurant O Camilo, which gave the beach its name. The restaurant is quite popular among locals and serves many regional fish and seafood dishes. From the restaurant you have a great panoramic view. It is a good restaurant, but prices are slightly higher than average. The restaurant is open from 11 AM to 12 PM and is closed on Mondays. 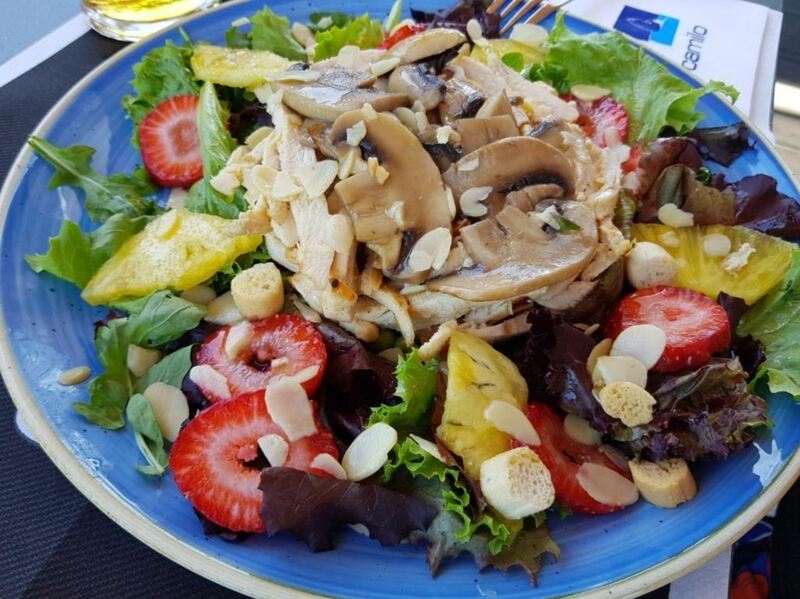 Since there are no other restaurants near the beach, it is recommended to bring some water and several snacks with you. Villas D. Dinis. This highly rated guest house is located near Ponta da Piedade. 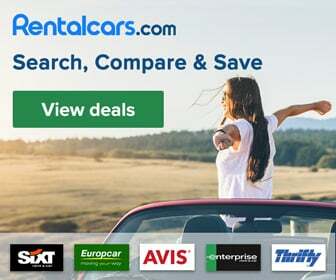 It has everything you need to guarantee a great holiday in the Algarve. This hotel is only for adults. Costa d’Oiro Ambiance Village. This 4 star hotel has a nice terrace with a swimming pool. They also provide many activities, so you can make the most out of your stay in Lagos. Cascade Wellness & Lifestyle Resort. 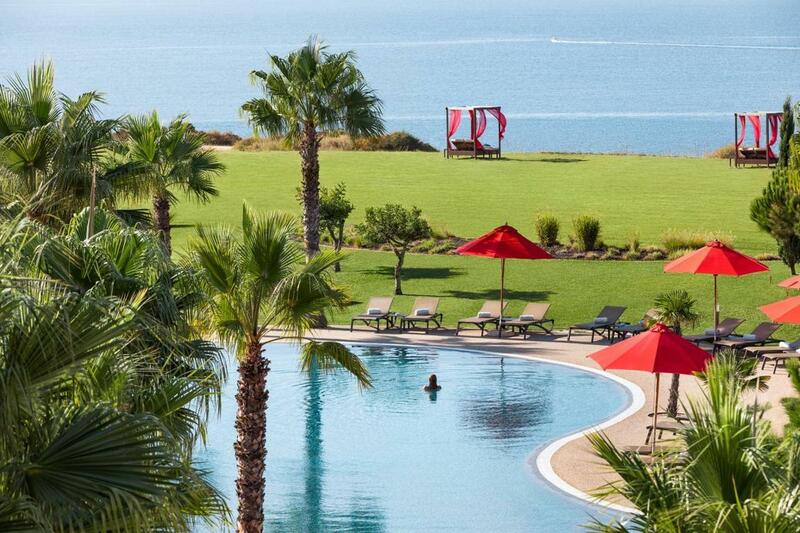 This 5 star resort has a big outdoor terrace with an awesome swimming pool. They have many wellness facilities, including a jacuzzi, body treatments, massages and a personal trainer. Everything you need to relax during your holidays. Praia do Camilo is about a one hour drive to the west from Faro airport. The nearest town is Lagos. The beach is on the road from the town of Lagos to Ponte da Piedade. 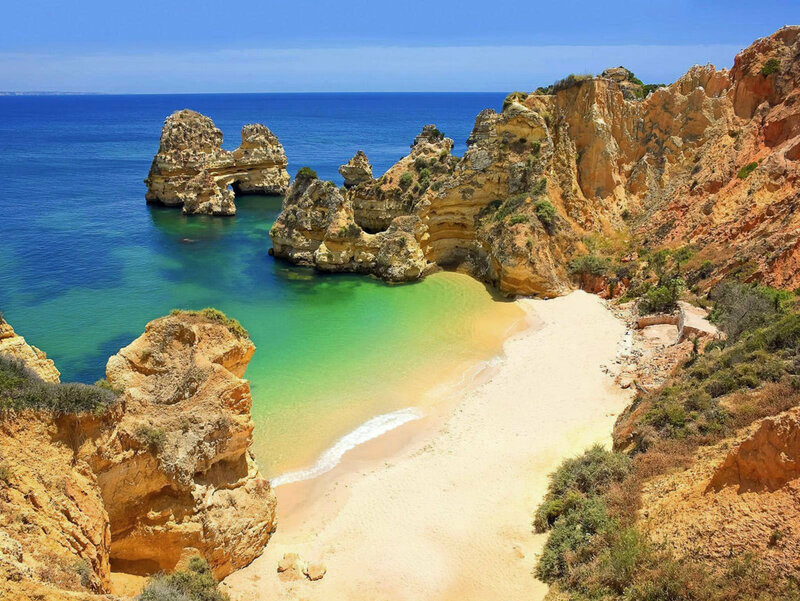 You can enter the following address in your GPS to get there: Estrada da Ponta da Piedade, Praia do Camilo, 8600-544 Lagos, Portugal. There is free parking space available near the restaurant, but limited. During peak season it is advised to arrive as early as possible to find a parking spot. Otherwise you can always park your car next to the road. From the centre of Lagos, it takes about a 30 minute walk to get to Praia do Camilo. Praia do Camilo is located near other miraculous beaches that tick all the right boxes. Instead of driving there, why not explore the surroundings of Praia do Camilo by boat or kayak. If you book a guided excursion, you will see the area from another perspective while listening to interesting stories from the guide. 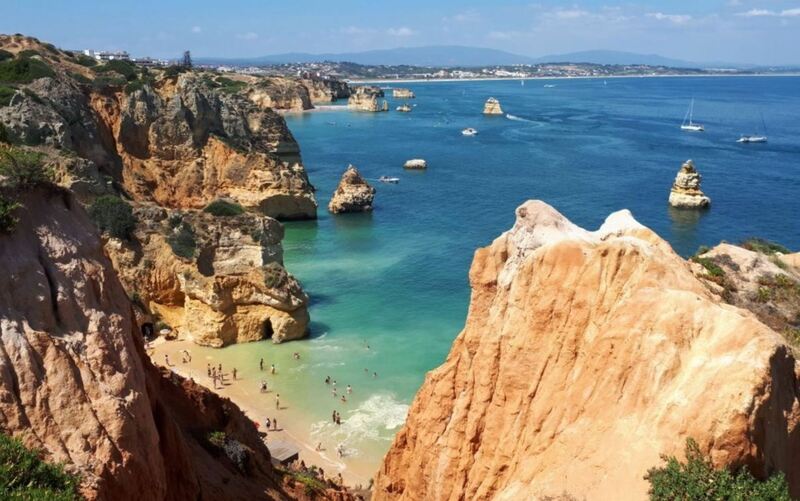 Especially Ponte da Piedade is a magical must see that we recommend. Praia do Camilo has earned the esteemed status of being a Blue Flag beach. A Blue Flag beach has an environmental label that indicates that the beach meets very strict environmental and safety standards. Other than the restaurant o Camilo on top of the cliffs, there are few facilities near the beach. It is recommended to bring your own sunbeds, parasols, food and drinks. For people who can only move around with the help of a walker or wheelchair, Praia do Camilo is not the best beach to access. There is no access for disabled people.